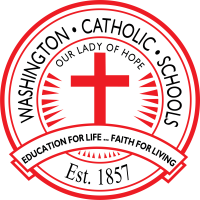 Continuous Catholic education in Washington has existed since 1837. The Sisters of Providence, Sisters of St. Benedict, Ursaline Sisters, Brothers of the Scared Heart, and Holy Cross Brothers from Notre Dame left indelible marks on our schools. The demand for excellence and a sense of pride stressed by members of these orders and by hundreds of dedicated lay teachers is a testament to our rich tradition. In 1837, Father Simon LaLumiere recognized the great need for Catholic education in Washington, where he hoped to grow and strengthen the faith in the community. The early school began in the tiny basement of St. Simon church. The Holy Cross Brothers from Notre Dame taught students, but the crowded and damp conditions and the lack of funds led to the downfall of the school. Catholic education remained a focal point of the parish. On September 26, 1857, the Sisters of Providence from St. Mary-Of-The-Woods answered the call and arrived to lay the foundation of the present Catholic school system in Washington. Saint Mother Theodore Geurin had dreamed of building a school in Washington long before the sisters were invited to open a school in the city. As Mother Superior, she had a vision of the enormous potential of a school in Washington because of the growing Catholic population in the community. The Sisters of Providence founded and operated a school that would become St. Simon Academy. Over the next hundred years, the school grew tremendously and the facility had to be expanded. The girls were taught by the Sisters and the boys were taught by the Brothers of the Sacred Heart. When the present Catholic high school building was completed in 1914, the boys moved into the new facility and the girls remained at St. Simon. In 1933, the Great Depression made it impossible to pay the Brothers so the school had to close. The girls eventually moved to the new school and it became a co-educational school in 1940. Saint Mother Theodore Guerin was recently named the patron saint of the Washington Catholic school system. To honor her work and that of the Sisters of Providence, a life-sized statue of Mother Guerin was casted in Italy. The statue was dedicated and placed on a five-foot granite pedestal at the corner of Hefron and Second Street, the site of the original school built in 1857.